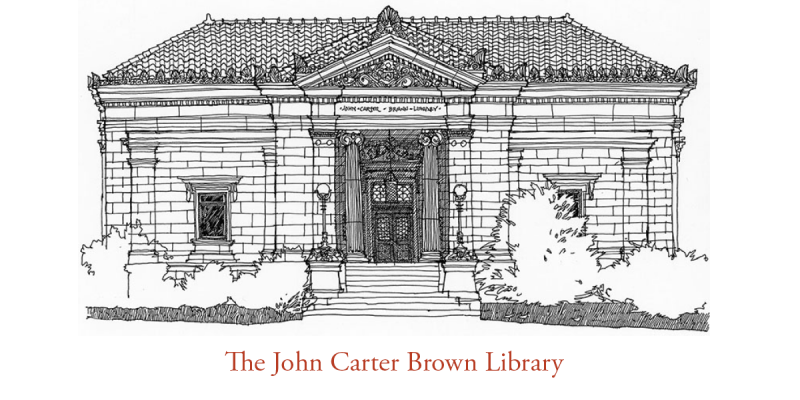 In this series we track the progress of the group of Brown undergraduates working to decipher, translate, and contextualize the “Roger Williams Mystery Book” at the JCB. For various reasons, the middle section proved particularly difficult to translate. 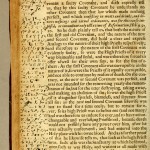 For one, whereas the first and third sections exhibit a mixture of shorthand and longhand marginalia, the middle section is written almost entirely in shorthand. Moreover, text in the middle section appears in a highly abbreviated form. At certain points, entire words appear to have been condensed into a single code character, standing for the first or last letter in that word. This requires some explaining. John Eliot was a prominent Massachusetts Puritan. Puritans, in contrast to Baptists, believed in the practice infant baptism. In fact, citizens of Massachusetts were required by law to baptize their infants – a law designed to drive the Baptists out of Massachusetts. 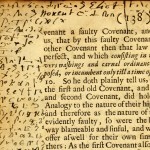 Eliot’s book, A Brief Answer to a Small Book Written by John Norcot Against Infant Baptism (1679) was the puritan rebuttal to Baptist John Norcot’s, Baptism Discovered Plainly and Faithfully, According to the Word of God (1672) which argued against the baptism of infants. Both of these books were published as part of a larger debate between the Baptists and the infant-baptizing Puritans, which raged throughout the 17th century. In the middle section, Roger Williams appears to be commenting on this debate, providing what looks like a rebuttal to a rebuttal to John Norcot’s small book, substantiated by original scriptural arguments. 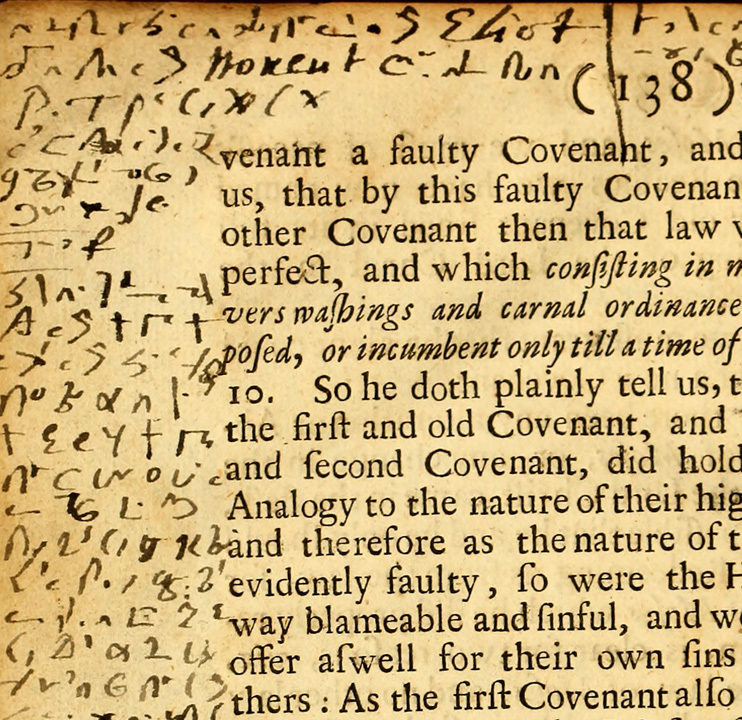 Though many questions remain unanswered, one thing is for certain: at least some of the notes appearing in “An Essay Towards the Reconciling of Difference Among Christians” were taken after 1679 (when Eliot’s book was first published). This has two important implications: first, it indicates that the issue of infant baptism remained an important issue for Roger Williams up until his death (Roger Williams died in 1683, at most four years after these notes were taken). Second, it tells us that “An Essay…” was in America around the time of Roger Williams’ death. This contradicts our previous hypothesis that all of the notes were taken between 1652 and 1654, during Williams’ final trip back to England. Personally, I am very excited about these discoveries. I hope to have more for you soon. The Great Spirit has been reminding me to study more about Roger Williams. My dad’s family (ALLEN)came from Rhode Island and my grandpa was full Am. Indian. I have been studying the Bible with a group of Jehovah’s Witnesses here in Pennsylvania…near Poconos Mts. the word “witness” was used by Roger Williams himself along with the term “SEEKER”. I wish we could talk in person LUCAS!!! Have a nice day and if u can, plz write me. PS Your work was cited on Wikipedia….ROGER WILLIAMS. What a fascinating project. I read the AP story about your find today and came here for more info. Congratulations on this work! This is very exciting. Were can the final results be found? 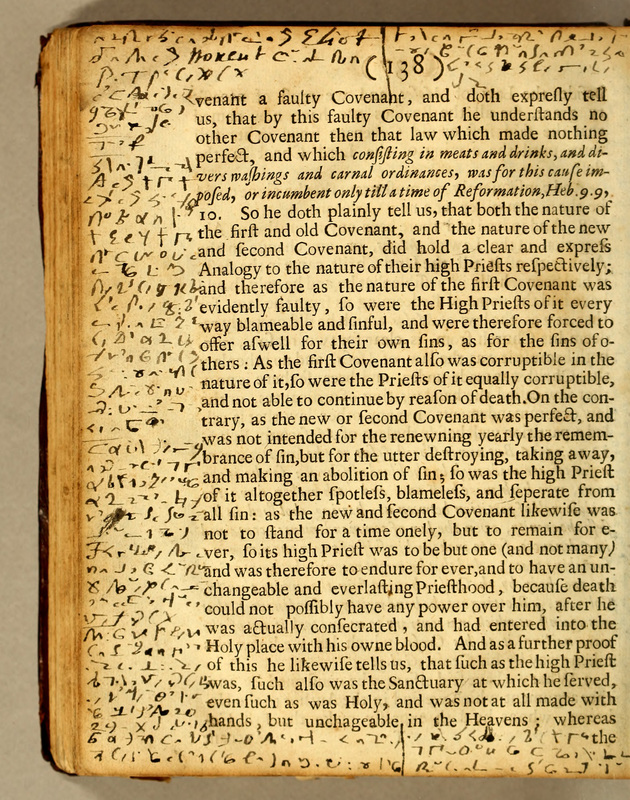 I’d love to understand more about the encoded marginalia. Did it contain just non-numerical text, or numbers too? Did you use software to crack it? Were there known algorithms you were able to reference? Second — I had the same reaction as your Dad. It reminded me of other Christian debates which were so momentous in their time, like the Arian controversy. And how dogma works in general to solidify social identity. Can you imagine writing laws to exclude Baptists from a state? Sounds a little like excluding Shia from Sunni countries. Good work, Lucas. What happened to the prurient marginalia you thought you had found? It appears that your meticulous work has paid off very well indeed. This adds to the primary historical record — very cool. Your explanation helps me to understand more clearly the passions and seemingly arcane logic which drove the New England colonies to form their distinct identities, and which was at the root of incredible turmoil in the English-speaking world in the late 1600s. I am waiting anxiously for the next installment. Does this imply that the third section of marginalia was also written later than you had assumed? It is interesting that the topic of infant baptism was one of such consequence. Makes me wonder which of our age’s fierce debates will seem of less importance 350 years from now.